5X USA National Sambo Team Coach and Champion Scott Sonnon spent 6 years studying “fringe sciences” in the former Soviet Union with their National and Olympic Coaches, as well as with their Special Operation Unit Trainers. Upon returning to America, he combined his experience in sports biomechanics, stress physiology and combat psychology to create a unique and powerful ally for those athletes who seek an unstoppable edge over their opponents. He was branded a “heretic” by traditional Sambo “politicians” because of his unwavering support for his mixed martial arts and submission fighting athletes. But Coach Sonnon has always shared his discoveries with athletes of any background, because he believes that evolution is more important than preserving an “ Old World” paradigm. Though his tools were forged in the fires of competitive fighting experience, his techniques and methods have trickled out into other amateur and professional sports, including the NFL, NHL and MLB, and even into scholastic sports programs… with incredible success! The Rapid Energy Sports Enhancement Technique (RESET) produces immediate, proven results, and with 2-4 months of consistent practice those results appear to be ongoing and permanent. 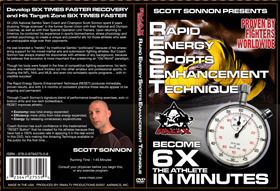 Coach Sonnon has such confidence in this trademarked “RESET Button” that he created for his athletes because they have had a 100% success rate in applying it in the real-world. In this DVD, he’s making this Amazing Technique available to the public for the first time.